Ministers and representatives of governments have unanimously adopted a political declaration reaffirming support for the Programme of Action of the International Conference on Population and Development (ICPD), which established that reproductive health, individual rights and women’s empowerment are critical to achieving sustainable development. The declaration came on the 25th anniversary of the ICPD, which represented a landmark endorsement of the human rights to reproductive health and autonomy. Fifty years ago, it was hard for women to obtain contraception and relatively easy to die giving birth. Many women were not allowed to decide who and when they wanted to marry, and when or whether to have children. But a worldwide movement to give women real choices in life culminated in the 1994 International Conference on Population and Development (ICPD), where a consensus was reached about the links between women’s empowerment, sexual and reproductive health, and rights and sustainable development. At that 1994 meeting in Cairo 179 governments adopted a revolutionary Programme of Action and called for women’s reproductive health and rights to take centre stage in national and global development efforts. Specifically, the Programme of Action called for all people to have access to comprehensive reproductive health care, including voluntary family planning, safe pregnancy and childbirth services, and the prevention and treatment of sexually transmitted infections. This new declaration now re-affirms global support for that – revolutionary – agreement, and calls upon leaders and organisations around the world to accelerate efforts to achieve its goals. It also underlines the importance of the ICPD agreement in achieving the Sustainable Development Goals, a set of global goals to eliminate poverty, achieve gender equality, and secure the health and well-being of all people. The United Nations Population Fund (UNFPA) and the United Nations Department of Economic and Social Affairs (DESA) together monitor population dynamics and progress made towards achieving the goals of the ICPD. The declaration was adopted on 1 April 2019 at the opening session of the 52nd session Commission on Population and Development in New York. Reports submitted to the Commission showed that progress has been made in expanding access to reproductive health, reducing maternal mortality, and addressing harmful practices and violence against women. But UNFPA’s Goodwill Ambassador Ashley Judd, who delivered the keynote address, said that as the Commission moves forward, members must be mindful that statistics represent real lives. In November, the Nairobi Summit on ICPD25 will seek additional commitments from governments, organisations, advocates and others, to accelerate efforts to realise these goals at last. The problem is that we know how to meet the sexual and reproductive health needs of virtually all people, and we have the medical advances, technologies and knowledge to empower every individual to make their own sexual and reproductive choices – no matter their income, location, gender, sexual orientation or disability status, but we are missing are the resources, political will and commitments to achieve this goal. And the concern is that without action now, this year, we may lose the momentum to realise these rights for all. “Maternal death has declined by around 40 per cent. Rates of child marriage and female genital mutilation have fallen. Primary school is accessible to most children in the world, and human life expectancy has increased by 7 years since 1994,” UNFPA’s Executive Director Dr Natalia Kanem said in her opening remarks at this year’s conference. “Yet the successes we have seen are not sufficient,” she continued. 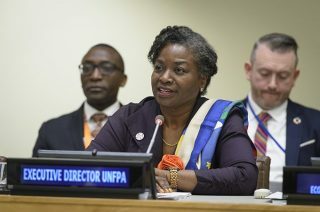 “Millions of people are still waiting for the promise of the ICPD: the more than 10 million girls who will be married under the age of 18 in 2019, the nearly 4 million girls who will undergo female genital mutilation this year, the 60 per cent of young people in Africa who will not access secondary school, the more than 200 million women and adolescent girls waiting for modern contraception. “ICPD is a benchmark for certain truths on which we can all agree,” Kanem added. To read UNFPA’s report the State of the World Population 2019, click here.